The FOUNDATION of Mormon beliefs is the ROCK OF REVELATION. “10… for the testimony of Jesus is the spirit of prophecy.” (Rev. 19) The Bible has been a primary source of God’s relationship with His people, laws of God, and beliefs. PILLARS of Mormon beliefs are God’s holy PROPHETS. There have never been a people that God recognized as His own without communicating with them. The Bible offers us 4,000 years of the association of God with His people. Yet, outside of this one church none have ever had a prophet to assure the people they are walking on the path of light and life. The PRIMARY MORMON BELIEF is in the true and living God of Israel (as identified in the Bible). “15 And God said moreover unto Moses, Thus shalt thou say unto the children of Israel, The LORD God of your fathers, the God of Abraham, the God of Isaac, and the God of Jacob, hath sent me unto you: THIS IS MY NAME for ever, and this is my memorial unto all generations.” (Ex. 3) No man can have gospel faith leading to salvation without a correct understanding of the attributes, character, and perfections of God; and a proper understanding of Jesus. “3 And this is life eternal, that they might know thee the only true God, AND Jesus Christ, whom thou hast sent.” (John 17) Jesus is to return soon ” “8 In flaming fire taking vengeance on them that know not God, and that obey not the gospel of our Lord Jesus Christ: 9 Who shall be punished with everlasting destruction from the presence of the Lord, and from the glory of his power.” (2 Thess. 1) Information on the TRUE GOD AND JESUS is available on various pages; including Part One of the Doctrine and Covenants and in the Book of the Law. A THIRD PRIMARY BELIEF is to “…seek ye first the THE KINGDOM OF GOD, AND his righteousness; and all these things shall be added unto you.” (Jesus, Matt. 6:33) There can be no salvation outside the Kingdom of God. EVERY KINGDOM must contain five basic principles: (1) a KING, (2) LAWS, (3) OFFICERS, (4) provision for adopting aliens, and (5) legal MEMBERS/citizens. Jesus is the King over the Kingdom of God in this creation. “1 In the beginning [of this creation] was the Word [Jesus], and the Word was with God [the Father], and the Word was God [of this creation]. 2 The same was in the beginning with God. 3 All things were made by him; and without him was not any thing made that was made.” (John 1) “5 And now, O Father, glorify thou me with thine own self with the glory which I had with thee before the world was.” (Jesus, John 17) After Jesus kept a perfect law, Satan had no power over Him and the Father raised Him from the dead with an immortal physical body. Then Jesus was given all power in this creation. “18 And Jesus came and spake unto them, saying, All power is given unto me in heaven and in earth.” (Matt. 28) JESUS IS KING OVER THIS CREATION. Obedience is the first sign of love. Jesus was asked: “36 Master, which is the great commandment in the law?” Jesus answered: “37 Thou shalt love the Lord thy God with all thy heart, and with all thy soul, and with all thy mind. 38 This is the first and great commandment. 39 And the second is like unto it, Thou shalt love thy neighbour as thyself.” (Matt. 22) This second most important commandment is found only in the Book of the Law of the Lord translated by James J. Strang. “10 If ye keep my commandments, ye shall abide in my love; even as I have kept my Father’s commandments, and abide in his love.” (Jesus, John 15) The law of God was contained in the Book of the Law of the Lord. It was given to Adam and lost some time before Moses; and was restored through him on tables of stone written by the finger of God. Moses made copies of the Book of the Law for the priests to teach the people. Shortly before the Babylonian Captivity–in 588 BC–the Ark of the Covenant was hid on a mountain by the prophet Jeremy and all copies of the Book of the Law were destroyed because it was felt to sacred to fall into the hands of the gentiles. God had already prepared for this event. In 600 BC, God called a prophet in Jerusalem to travel to a far distant Promised Land–Zion. Before leaving, God required his son to return to Jerusalem and obtain the plates containing sacred writings. Among those was the Book of the Law. About 400 AD the remnants of this people were destroyed by their enemies. The last man was a prophet of God who buried the plates to be recovered in the last days. Joseph Smith–under the direction of an angel of God–recovered those records. Joseph was commanded to translate the record of part of the ancient inhabitants of this continent–Native Americans. The book was entitled the BOOK OF MORMON. This is where the latter day saints enemies drew the name Mormons. The former day saints in the days of the apostles were called Christians in derision of their faith. Christians welcome this name today, just as the latter day saints welcome the term Mormons. As noted in the prophecy of Ezekiel at the head of this page, there were to be two prophets and two works revealed in the last days. Joseph Smith fulfilled one of these: the Book of Mormon because he was of the seed Joseph; but, was not permitted to translate the Book of the Law because that was to be the work of a prophet of the tribe of Judah: James J. Strang. True latter day saints accept the Bible, Book of Mormon, Doctrine and Covenants, and Book of the Law as scripture because all were in part or whole the works of God. “16 All scripture is given by inspiration of God, and is profitable for doctrine, for reproof, for correction, for instruction in righteousness: 17 That the man of God may be perfect, thoroughly furnished unto all good works.” (2 Tim. 3) The Original Doctrine and Covenants and the Book of the Law of the Lord are contained in this web site. The Book of Mormon is lengthy and already available on other sites. Every OFFICER in the Kingdom of God must be called of God and ordained by one holding that office. Not even Jesus could violate this law. “4 And no man taketh this honour unto himself, but he that is called of God, as was Aaron. 5 So also Christ glorified not himself to be made an high priest; but he [the Father] that said unto him, Thou art my Son, today have I begotten thee. 6 As he saith also in another place, Thou art a priest for ever after the order of Melchisedec.” (Heb. 4) Aaron was called by a revelation given to Moses; and ordained by Moses who held the superior Prophetic Office like Jesus and many others. After the 1,260 years, “I saw another angel fly in the midst of heaven, having the everlasting gospel to preach unto them that dwell on the earth, and to EVERY nation, and kindred, and tongue, and people.” (Rev. 146) If there had been anyone remaining in the Kingdom of God, this would not be necessary. A complete restoration of the priesthood and gospel of God was required. Enter Joseph Smith. When he was only 15 years old, there was a great excitement over religion. Joseph earnestly sought to determine which one was right; because when there are two difference positions both can be wrong; but, only one can be right. After reading the Epistle of James to “ask of God,” Joseph went into the woods and prayed with all his heart. After first being overcome by a powerful being that rendered him speechless and unable to move, he used all his strength to call upon God. Then a light appeared brighter than the sun; and he was delivered from this enemy. In the light stood two personages. He wrote, “One of them spake unto me, calling me by name and said, pointing to the other–This is my Beloved Son, Hear Him!” He was told that all the sectarian churches were corrupt and not to join any of them. Three years later an angel appeared to him in his bedroom, said his name was Moroni, and that there were records of the ancient inhabitants of this land. Joseph had to wait another four years for the time to recover these records. Joseph was given power from God to translate part of one of those records: the Book of Mormon. Another book–the Book of the Law of the Lord–was among the plates; but Joseph was not permitted to translate it. “14. And now, when I Nephi, had heard the words of the Lord which he spake unto me in the wilderness, saying that Inasmuch as they seed shall keep my commandments, they shall prosper in the land of promise. 15. Yea, and I also thought that they could not keep the commandments of the Lord according to the law of Moses, save they should have the law. 16. And I also knew that the law was engraven upon the plates of brass.” (1 Nephi 4) This Book of Mormon was a record of Native Americans who were led to this continent by God. It was a second testimony affirming that Jesus was the Christ, contained laws of God, and the fullness of the gospel. On June 18, 1844, Joseph Smith received a revelation from God telling him to write a Letter of Appointment to James J. Strang fulfilling the law to appoint another in his stead. He composed the letter on June 18, and mailed it the next day. On June 27th, with the help of the Governor of Illinois, a band of men shot and killed Joseph. The same hour of his death, James J. Strang–some 400 miles away in Burlington, Wisconsin–claimed to have been ordained in Joseph’s stead under the hands of angel(s). The Letter of Appointment arrived by regular course of mail on July 9th. This letter is now in Yale University Library. As a man-made Prophet he introduced numerous false doctrines into his church. He even taught that God had a father, grandfather, etc. ; and that Adam was actually God and Eve a wife from another planet. James J. Strang fulfilled all of the duties of a Prophet, Lawgiver, Seer, Revelator, and Translator (see Prophetic Controversy). He translated the Book of the Law of the Lord which is the single most important book of scripture that was contained in the plates recovered by Joseph Smith. His teachings supported those of Joseph Smith. James was the only man that claimed a valid calling from God and a valid ordination under the hands of angel(s). 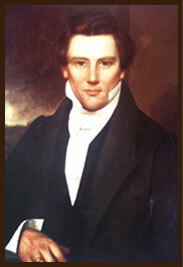 More information on this subject is available in the pages “LDS Prophets” and “Prophetic Controversy.” The followers of James J. Strang have held fast to the original beliefs of the Bible, Book of Mormon, 1835 Doctrine and Covenants, the revelations of James, and the teachings of Joseph and James. In the Letter of Appointment God selected Voree–near Burlington–as the gathering place of the saints. Voree means “Garden of Peace.” The saints were never persecuted by their enemies. When they failed to gather and follow all the laws of God, the gathering was moved by God to Beaver Island in northern Lake Michigan–where they were severely persecuted. On June 16, 1856, two apostate Strangites–with the help of the captain of the US Steamer Michigan–shot James. 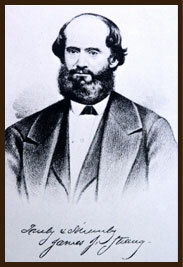 He was taken back to Voree where he died on July 9, 1856. Although both prophets were murdered with the help of the government, a remnant of the Melchisedec Priesthood remains today. Before his death, James ordained L. D. Hickey one of the Twelve Apostles. Hickey ordained Samuel Martin a high priest, who ordained Lloyd Flanders a high priest, who ordained Samuel E. West an elder on July 8, 1956. THIS SITE is maintained by Samuel E. West, senior elder, in the (Original) Church of Jesus Christ of Latter Day Saints (known as Strangites after the death of Joseph Smith). The purpose of this site is to offer an understanding of true Mormon identity, beliefs, the church, and an opportunity to correspond, question, and investigate those people commonly known as Mormons. This site is dedicated to those earnestly seeking spiritual truth. Pursuit of salvation should be the subject of greatest concern. Jesus is to return very soon, “In flaming fire taking vengeance on them that know not God, and that obey not the gospel of our Lord Jesus Christ.” (2 Thess. 1:8) The Bible tells that most people on the earth will soon be destroyed by fire, pestilence, and plagues more horrible than the mind can imagine. “21 For then shall be great tribulation , such as was not since the beginning of the world to this time, no, nor ever shall be. 22 And except those days should be shortened, there should no flesh be saved: but for the elect’s sake [Israel] those days shall be shortened.” (Matt. 24) Knowing God and obeying the gospel provides the only escape from this desolation; often called Armageddon. True Mormons believe that the God of Abraham, Isaac, and Jacob is the only true and living God; and that His only begotten Son Jesus Christ is the only pathway to salvation through the gospel. They believe the gospel of Christ precisely as it is given in the Bible. They believe the organization of the kingdom of God and Church of Christ is the same in all generations; having officers with divine authority to act in the name of God. These have divine authority to bind on earth and in heaven. From baptism to marriage, families were united in death, the resurrection, and for eternity. Were you only married, “until death do you part”? Why? In 325 AD, Constantine reorganized the Christian Church; and adopted the gods, authority, rest day, doctrines, rites, and festivals of paganism. You may return to this Home Page at any time during your study of this site. Your questions and suggestions are welcome. Only through improved communication will non-Mormons and the various groups of apostate Mormons come to an understanding of true Mormon Beliefs and have a sure foundation for salvation and eternal life.